This article has been written with the support of Eventbrite. Find out more. We've all been there: having an ace time watching our favourite band onstage, only for someone to hoist their phone in the air and start filming, obscuring the view. Like noisy eaters in quiet cinemas or persistent chatterers in the theatre, it's another example of that ever-present tension: the joy of communal experiences being ruined by their very communality. If you'll excuse the pretentiousness of quoting Sartre, the fella had it right – hell is other people. The good news for career grumblers is that this particular gripe is no longer purely anecdotal. 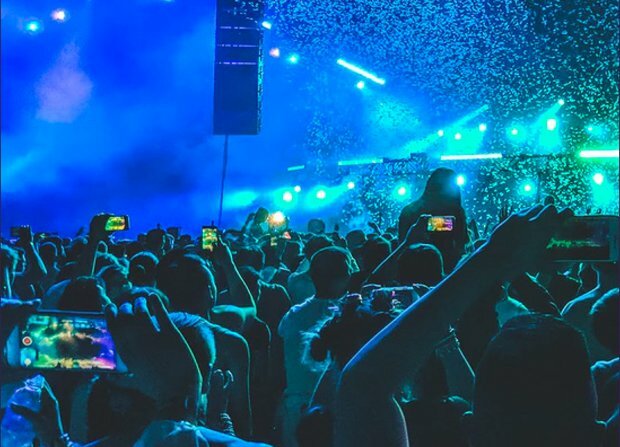 Eventbrite has published a report detailing just how nippy it is when someone records a gig on their phone. A full 70% of the thousand-odd punters surveyed said they found it 'irritating' (you can guess what the other 30% were doing); 69% said they'd be in favour of some measure to prevent it, such as designated 'no-phone zones' or introducing 'gentle nudges to make phones more discrete'. Nobody wants to be the one dictating what people can and can't do (and if you do, then mate, you've got other personality problems to deal with), but there's gotta be a middle-ground, right? Performers have difficulty with the whole phone thing too. Techno DJ Anja Schneider is quoted in the report, saying: 'Do I find myself playing to a forest of arms waving phones in the air? Of course and that's a problem because first of all, you can't see the people – you can't feel the vibe. You can't see people's faces.' Singer-songwriter Jamie N Commons also chimed in: 'You can build more of an audience reaction when people are really paying attention.' And that's without getting into thorny legal territory: at what point does your clip of a musician, uploaded to YouTube (where you could potentially make ad revenue off it), become a pirated version of their intellectual property? Perhaps the report's most eyebrow-raising stat is that even the people filming don't like it. 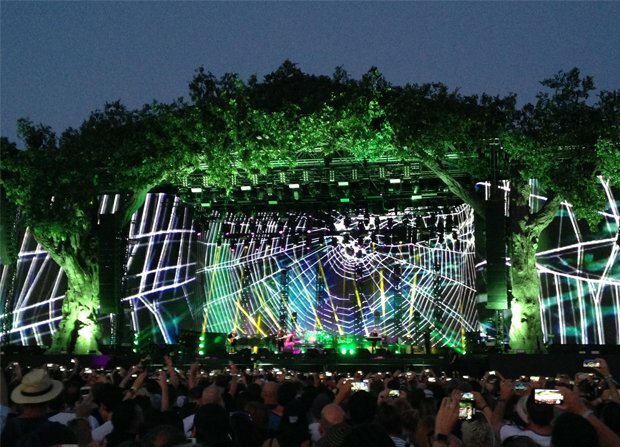 65% of respondents said that 'using their phone to capture images at a performance made them feel as if they were missing out on the event itself'. 81% said they understood 'why an artist might not like videoing and photographing at the event' – which, unless I'm wilfully misunderstanding the numbers (entirely possible), means 16% knew it was annoying but did it anyway. There's a hint at the end there of what the solution might be – artists themselves giving audiences a steer on proper protocol. 'Bring Me The Horizon did a couple of underplay shows,' says Anton Lockwood, of promoters DHP Family, 'and they said at the start of the show, "Right, you're going to want to film this, we know you're going to want to film this and take pictures, so we're going to nominate a song early on where everyone can film and take pictures during this song and then put your phones away and go crazy!"' There's maybe also an argument to be made for incorporating phones into the performance – at Anderson Paak's recent Glasgow show, the man himself conjured up a shimmering galaxy of LED lights from audience members' phones to mesmerising effect. He's probably not the first artist to use such a trick, but it does suggest that there are more inventive solutions than simply banning phones outright, or sealing them in tamper-proof bags (as favoured by Alicia Keys, Guns N Roses and more). The report makes the interesting point that it's only been 12 years since the first iPhone revolutionised how we think about smartphones; maybe, with more time to adjust, we'll develop a better sense of etiquette around using them. Or maybe some will just keep blocking the view from the dancefloor and the rest will keep having to tolerate it. It's probably the second one. To find out more, check out Eventbrite's full report: Social Rules Around Phones at Gigs are Changing. Ready to organise your first event? Create professional event ticketing and registration pages in minutes. Whether you're launching a comedy night, throwing your first party at a venue or ticketing a festival, our streamlined technology helps you get up and running quickly – and looks great on any device.